We introduce various examples of ultrasonic inspection, measurement, evaluation about plants which are facing the aging in Japan. We introduce the ultrasonic inspection method by using soft probe to welded bead portion: the detecting surface of this probe is very soft to enough fitting. 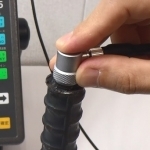 We introduce the ultrasonic inspection method to the filled weld in lap joint by soft probe. the detection surface of this probe is very soft to enough fitting. We introduce the rough surface such as gas cutting surface by soft probe which fits the rough surface. We introduce the inspection of welded beam part by bending array probe "BFAP" (broad band high sensitive flexible array probe).